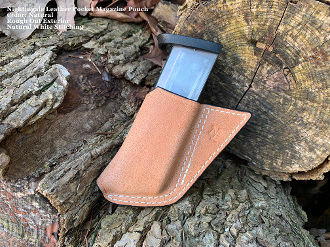 This single magazine pouch is designed to be worn off hand weak side in the front pocket. Bullets forward. A fantastic on the go option. Optional exotic & full grain leather lining available. Note the exotic materials such as elephant and shark will be smooth exterior side out. Cowhide will have the optional smooth out or rough out exterior.